Greetings, Shredderz! Today we’ve got a quick check in on a very cool board: a T&C Surf Glenn Minami twin fin from 1978. Put your wallets away, though, because the eBay auction is already done and dusted. All photos in the site are via eBay; you can find the original listing here. I’ve said it before, but it bears repeating: as much as everyone loves the 80s T&C Surf boards, I think the earlier single fins and twin fins are a bit underrated. As is always the case with noteworthy surfboard labels, T&C Surf Designs has its foundation in the combo of talented craftsmen and gifted surfers. According to T&C’s website, T&C Surf founder Craig Sugihara was inspired after riding a Mark Richards twin fin during the early 70s. Sugihara then enlisted Glenn Minami to continue to iterate on the design. Shortly thereafter, Dane Kealoha joined the roster and the rest is history. As for the T&C Surf Glenn Minami board you see here, it measures in at 5’8″ x 20″ x 2 3/4″. According to the seller it was shaped in 1978, during the relatively early days of the Town & Country label. Overall the board looks to be in pretty good condition, although it looks like the swallowtail underwent some surgery. The board is super colorful and eye-catching, and while it’s not quite as crazy as the neon airbrushes that would define T&C’s look in the 80s, I really dig it. In particular, the fins are a super cool touch, especially with T&C’s classic yin yang logo on them. And yes, this is a Price Checks entry, so you know we’re going to discuss the price tag on this bad boy. The final price was $860. This is a shade lower than what I would have guessed, but even so, it’s a healthy price for a forty year old board. The board looks to be in good condition aside from the aforementioned work on the tail. The T&C Surf Glenn Minami twin fin is no longer for sale but you can check out the eBay listing here. Finally, Glenn Minami continues to shape surfboards today. He shapes under his own name, rather than the T&C Surf label, and you can find more about Glenn’s boards on his website or follow him on Instagram. Greetings, Shredderz! Today we’ll be examining one of the most coveted signature sticks out there: a T&C Surf / Hawaiian Pro Designs Larry Bertlemann surfboard. As I have written about before, getting concrete information on surfboard prices can often be tricky, but eBay makes things slightly easier, thanks to the fact it keeps up posts on completed listings even after the sale has closed. The Hawaiian Pro Designs Larry Bertlemann surfboard featured here just closed earlier today on eBay, and thankfully, the listing still has pics and prices. You can find the listing here; all photo in this post are via eBay. This Hawaiian Pro Designs Larry Bertlemann surfboard closed at a cool $1,085, with an option to ship the board within the US for an additional $100. The board is a swallow tail twin fin and it measures 5’10” x 20″ x 3″. On one hand, I can’t say I’m that surprised, as these Larry Bertlemann boards are super popular among collectors. On the other, this board has discoloration throughout, and some additional restoration work has been done, too. The board is in decent condition, all things considered, but it’s also clearly not a perfect example. I see the price as an indication of how collectible Bertlemann surfboards are, given that it still went over $1K, even with its various imperfections. I’m curious to see what a similar Larry Bertlemann surfboard in excellent condition might fetch — I can’t see one going for anything less than $2,000, but that’s only a guess. I still can’t quite figure out whether the Larry Bertlemann surfboard you see here is considered a Hawaiian Pro Designs board, or a T&C Surf Designs board. As you can see it has laminates from both brands. 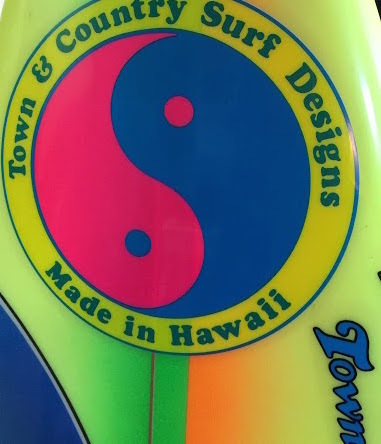 The T&C Surf Designs yin yang features prominently throughout the board, but all of the Pepsi Larry Bertlemann logos have Hawaiian Pro Designs on them, too. Hawaiian Pro Designs is best known for being Donald Takayama’s label during the later part of Takayama’s career. However, I simply don’t know about the earlier history of the Hawaiian Pro Designs brand. See here for a Hawaiian Pro Designs Larry Bertlemann surfboard that has a rare Olympic rings logo, but no mention of T&C. 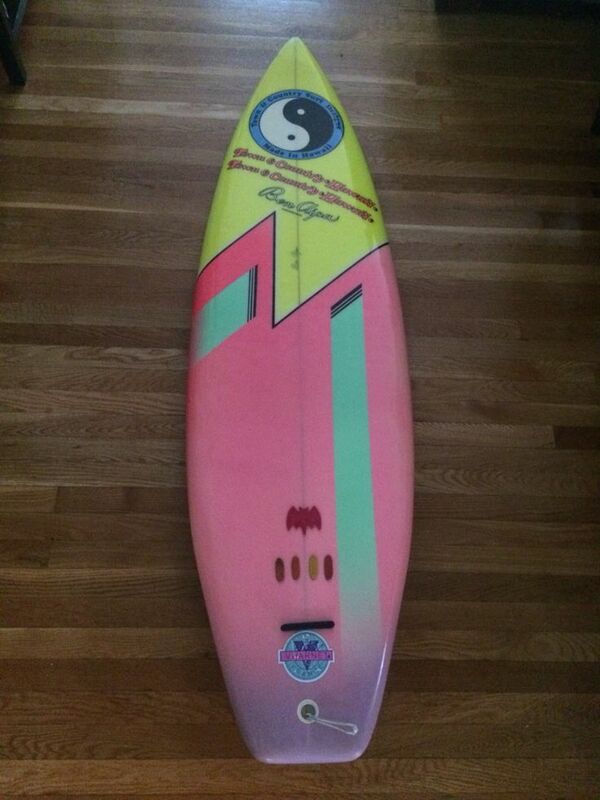 And here is another Larry Bertlemann surfboard, which has the T&C Surf Designs yin yang logos, but otherwise no T&C branding (looks like the sticker on the fins was added after the fact). Long story short, I don’t know how to classify the brands and/or labels for Larry Bertlemann’s various signature surfboard models. I also don’t know who shaped the board. Bertlemann shaped some of his own surfboards. According to SurfboardLine.com, Takayama also shaped some twin fins for Bertlemann during the Seventies, but I’m not sure when. These Larry Bertlemann surfboards were produced under license in Australia for a while, too, but again, I’m not clear on who the production shapers were. Finally, see below for a little video produced by Buggs Arico, the collector behind the aforementioned SurfboardLine.com. Buggs’ site has a great entry on Bertlemann, including a killer Larry Bertlemann surfboard producer under the killer Hot Lips Designs label, so check that out if you get the chance. Greetings, Shredderz! For those of you who don’t know, Sagas of Shred is a series on the blog where we run vintage surf ads. While old magazine articles are great — The Surfer’s Journal digital archive, available to subscribers, is amazing — an overlooked angle is the fact that surfing’s story often gets told in the form of ads. The T&C Surf Designs Christian Fletcher ad featured here ran in a 1990 issue of Surfer Magazine. To me, it’s a pretty classic expression of surf culture at the time, between the tail end of the Eighties and the Momentum Generation, which would arrive a few short years later. If I’m being honest, I often struggle to describe these ads. There’s no denying the unintentional humor. But the last thing Sagas of Shred aspires to be is the douchebag hipster that hides its unpleasant contempt behind a thin veneer of so-called irony. I can genuinely say I love this ad, and not just because it features one of the most influential surfers of the late Eighties and early Nineties. I love everything about it, whether it’s the odd torn paper effects, Fletcher’s vintage T&C shirt, or the unsettling feeling that Christian Fletcher might be trying to challenge you to a staring contest. While many elements of the ad are charmingly dated to the late Eighties and early Nineties, the same cannot be said of Fletcher’s surfing. His front hand layback gouge is every bit as radical as it was when the advertisement first ran. I’ve written a lot of Sagas of Shred posts about Fletcher and his family over time. We have featured T&C Surf Designs in Sagas of Shred a number of times as well, whether it’s a 1982 ad featuring Dane Kealoha in some short shorts, or another entry featuring the evolution of Ben Aipa’s famous Sting design. I think we can all agree that the Christian Fletcher / T&C Surf Designs marriage is one for the ages. Thanks again for checking out Sagas of Shred and tune in late next Thursday night for more vintage surf ads! Greetings, Shredderz! I hope a weekend chock full of tasty waves is on the forecast. In the meantime, see below for a selection of some wonderful boards that have recently caught the eyes of the Shred Sledz editorial staff. Ben Aipa. Town & Country Surfboards. Neon. There is nothing else that needs to be said about this gem. There’s actually a Harbour Trestle Special for sale on eBay right now. You can find the eBay board here. Unfortunately, the example that’s being sold isn’t in great condition, which is more or less expected, given the age of the board. The example above is super clean and it also has a great close-up shot of the fin. We’re big fans of Rich Harbour here at Shreddies, and we’re always on the lookout for a particularly cherry example of a Harbour Trestle Special! Hilarious Simon Anderson / Nectar Surfboards ad from back in the 1980s. According to the caption, the ad originally appeared in Australian Surfing Life magazine. I had always thought Nectar Surfboards had only distributed Anderson’s thrusters in the US, but I guess I was mistaken! Greetings, Shredderz! Today we have a quick check-in on the market for 1980s boards, many of which feature the bright colors and loud graphics that came to define the decade. Trying to find information on fair prices for boards can be a frustrating experience. By referencing some recent eBay sales, including examples of some 80s T&C surfboards, the hope is this post can help collect useful information on board prices. This board is pictured above (photo via the eBay listing). The board is in good condition, but it has some obvious flaws, including sun damage on the bottom, and some obvious ding repairs. This next part is pure speculation, but I believe the paint job, while recognizable as an 80s design, is less coveted than some more over the top examples. Nonetheless, the closing price says it all. Vintage T&C 80s surfboards remain incredibly popular among collectors. I was a little surprised that the price on Board #2 came in so far below Board #1. Board #2 has a cool spray job on the deck and then a bright pink color on the bottom. Unfortunately, Board #2 features a huge piece of Gorilla Grip traction covering a good chunk of the deck. You can also see a bunch of small dings covering the bottom of the board. I tend to think this is at the lower price range for T&C 80s surfboards. While Board #3 is the cheapest of the vintage 1980s T&C surfboards covered in the post, I think it’s a pretty fair price. First, the board is pretty faded, and there are multiple spots on the deck. Considering that T&Cs are coveted for their graphics, anything that will compromise the visual aspects of the board are likely to mean a discount in price. Board #3 never had a statement paint job to begin with, either. In general, I would say Local Motion boards are not as coveted as their Town & Country counterparts. I think Board #4 is an example of the fact that graphics and condition can often be the most important variables when considering the end price. The board has a beautiful paint job; the only reason I am not including a picture here is because I have already used many of eBay seller cashjack‘s photos in previous posts. Please click through to the listing! There are two other interesting aspects about this board: first, it originally sold for $511 about a month ago, and when the original buyer didn’t want to pay shipping to Hawaii, the board was re-listed on eBay. I can’t say if the price increase has anything to do with market trends or just randomness. Second, unless it’s a typo on the listing, the board is 5’0″ x 17″ x 2-1/2″, which is quite small. If these measurements are correct, then I suspect most buyers are looking at the board as a wall hanger. I saved the best for last. Board #5 is also being sold by cashjack. You must click through to the listing and check out the pink and purple checker spray job on this bad boy. There are still three days left in the auction, but the price is already hovering just below $500. I would expect this board to eclipse the price set by Board #4. Again, I think this is a testament to how important visuals are with these boards, given that Town & Country is a more coveted brand than Local Motion (generally speaking, of course). I hope this was a helpful snapshot at the state of the market for vintage surfboards from the 1980s. As always, if you have more info or context, please give me a shout! Greetings, Shredderz! While some surfboard aficionados don’t enjoy talking prices, here at Shred Sledz we’re not only fans of capitalism, but also transparency. One of the most iconic boards from modern pro surfing is Martin Potter’s T&C twin fin emblazoned with the iconic green and yellow airbrush. A Town & Country Pottz airbrush board recently sold on eBay, providing a little insight into the market for the former champ’s boards. I have included some pictures of the board below (pics via the original eBay listing). The final price for the board ended up being $1,300. As you can see in the pictures above, the board is in pretty good condition (I omitted a picture of a decent ding along one of the board’s rails). First, if you’re inclined, I think there are some questions around whether or not the example above should be considered a proper Pottz board. Of course, Potter rode for T&C, and the airbrush is unmistakable, but as far as I can tell, T&C never released a mass market Pottz model until recently, the way Channel Islands put Tom Curren’s Black Beauty design in surf shops everywhere. Then again, that’s not the point: the board above is a genuine Town & Country board from the 1980s in good condition, complete with an iconic design. Is it nitpicking to mention that the airbrush on the board above is a lesser-known variant on the classic Pottz spray job, and not the original one? I won’t attempt to answer the metaphysical questions around how one defines a Pottz board. Instead, I’ll just state the obvious: cool surfboards from the 1980s often command a pretty penny on the open market. Pictured above is a classic 80s Town & Country Surfboards design that is currently for sale on Craigslist in San Diego (link to the board can be found here.) The seller is asking $500, which is certainly not cheap, but the eighties Echo Beach-inspired boards are popular among collectors. A few interesting things about this board: first, there’s a Surfside Sports logo. Surfside Sports is a surf shop that helped launch the Echo Beach craze. However, there’s a great chance that this could be a sticker applied to the board, versus a lamination beneath the glass. No way to know for sure from the pics. The other detail that caught my eye is that there are clear signatures in the last picture for both the shaper and the airbrush artist. Unfortunately, I can’t make out either name. If anyone has any clues as to who might have shaped this board, I’d love to know! Once again, you can find a link to the board here. Back to our regularly scheduled weekend grab bags. Here’s a selection of some cool boards that have caught my eye recently. Sadly, there are no bargains to be had here. Seller is asking $2250 out the gate for this Aipa / Surfing’s New Image sting. Shout out to the seller for being clear about the fact this board was shaped by Rick Hamon, and not Ben Aipa himself (see here for an earlier Shred Sledz screed on the topic.) I have never seen that stringer setup before, and the airbrush on the bottom speaks for itself! Deck isn’t perfect but that’s like pointing out a small dent on a gullwing Mercedes. Check out the board here. Hit the jump below for some more boards, including another Aipa, and some transitional goodness.. Writing these posts is usually fun and easy, but today the flood of tears is making a little harder, as I come to grips with the fact that I missed out on a pristine Christian Fletcher model on eBay. You can see the completed auction here, and I have included the pictures on this post. I have written about the Christian Fletcher T&C signature model before. However, the more I look at this board, the more I believe that it might be the exact same one that I wrote about in this post. I’m wondering why this board – which first popped up on Vintage Surfboard Collectors – would have been sold on eBay with such minimal descriptions and no mention of the brand / pedigree etc. Seems a little odd, if you ask me. Either way, enjoy the pics, cuz I can’t get enough of this thing! How about surfcraft shaped by an undisputed master of the form? What are you feelings on ridiculous 80s paint jobs? (Related to question #1 above). Do old surfboards in impeccable shape titillate you? If you answered ‘yes’ to any of the questions above – especially the one about neon – then you need to check out this board on Craigslist, which can be found in Santa Cruz, California. It is a vintage Ben Aipa-shaped board for legendary Hawaiian surfboard brand Town & Country. The airbrush has a distinct 80s / 90s feel to it. The signature on the signature is clear as day, and it looks like the board was even shaped for equally well-known Hawaiian pro surfer Dane Kealoha! If it sounds like I’m frothing…well, I am! I love finding vintage surfboard gems, but the fact this one was made for one of the most influential Hawaiian pros ever is just the cherry on top of an already scrumptious surfboard sundae. In fact, I’m so stoked I don’t even care that the photography includes huge glare spots and there isn’t any mention of the dimensions or the fin setup. In any case, check it out for yourself here.